Equestrian Connect, the one-minute horse show entry service, is quickly becoming the best way for equestrians to submit their online entries. Top horsemen from around the country have been going to Equestrian Connect to save time and keep their information organized. Are you one of the many who still takes hours handwriting entry blanks? Find out why more people are using Equestrian Connect for electronic entries and how it can help you! In 2013, exhibitors have significantly increased their usage of Equestrian Connect’s entry service, particularly in submitting entries electronically. Equestrian Connect posts entry forms at more than 800 USEF “A/AA” rated shows across the country and more than 30 in Canada, making Equestrian Connect readily available. Approximately 300 of those shows accept entries electronically. Equestrian Connect saw a 30% increase nationally in entries submitted electronically in 2013, with over 26,000 entries created in total, and 15,000 submitted electronically. Sending electronically also gives Equestrian Connect users peace of mind that their entries arrived on time. They receive an email acnowledging that entries have been received, which saves them time calling the horse show office. 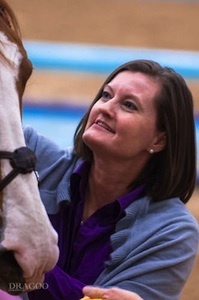 Waters has been receiving Equestrian Connect entries for the past few years. “It’s so much more efficient to use an Equestrian Connect entry blank than a regular one. Everything is typed out and in the right place. There is no question, it’s just there. We can just input and move on to the next one. It’s legible, and it takes a quarter of the time to input,” she explained. Annette Longenecker (right) of Ryegate Show Services also recognizes what Equestrian Connect can do for exhibitors. “What Equestrian Connect has done is allow the show and the exhibitor to function in the normal procedure, but give exhibitors a time-saving feature and the flexibility of the show to use the service as best fits their needs,” she said. In the second year that electronic entries have been accepted at The Hampton Classic Horse Show, there has been a 30% increase in electronic submissions. This year, the show received 350 entries through Equestrian Connect, which is 20% of the show’s total entries. This is the third year that Equestrian Connect has been the official entry partner of the Hampton Classic. “With Equestrian Connect as a partner, we offer our exhibitors the convenience of submitting their entries online. 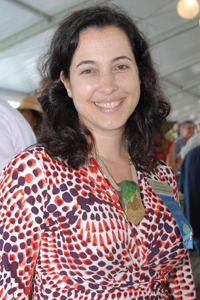 We have seen the demand for this convenience grow and are committed to offering the absolute best services to our exhibitors,” said Shanette Cohen (left), Hampton Classic executive director. Ali Sweetnam, who runs Sweet Oak Farm with her husband, top international show jumper Shane Sweetnam, in Wellington, Florida, has started using Equestrian Connect to send in her entries electronically. Handling show entries for 30-40 horses is an exercise in organization, and it’s one Chrissie Kear has streamlined with Equestrian Connect. As a trainer and manager at Ashland Farms in Wellington, FL, Kear started using Equestrian Connect two years ago to electronically submit entries at the Hampton Classic Horse Show. By saving horse and rider details on Equestrian Connect, riders, trainers, and barn managers can easily fill out entries for horse shows. Streamlining the horse show entry process is what Equestrian Connect does best – no matter who fills out the forms, they arrive at the horse show neatly typed, legible, and with full information. Equestrian Connect’s web-based entry service works with PCs, Macs, and iPhones, can produce printable entries for any horse show, and eliminates the need for trainers and exhibitors having to mail entries to the show office or FedEx them at the last minute.